For the first time, SONOMEDIN® has combined melatonin, L- theanine and standardized valerian extract to effectively cope with insomnia. SONOMEDIN® improves sleep due to helping physiologically maintain sleep cycles, generate alpha brain waves and reduce the effects of daily stress. Melatoninis a neurohormone of the pineal gland (epiphysis). The physiological secretion of melatonin is high when it is dark, reaching its maximum between 02:00 AM and 04:00 AM, and is low in the second half of the night. Melatonin regulates circadian rhythms and maintains the sleep-wake cycle. The endogenous melatonin production is decreased with age; therefore, melatonin improves the quality of sleep, especially in patients with primary insomnia aged over 55 years. The effects of melatonin on MT1, MT2, and MT3-receptors contribute to the quality of sleep. L-theanine is a natural amino acid derived from glutamic acid. L-theanine has a relaxing effect that alleviates the effect of daily stress and facilitates sleep onset. L-theanine improves the synthesis of GABA in the brain and, on its own, is able to stimulate the GABA receptors. L-theanine generates and regulates the alpha waves (with a frequency of 8-12 Hz) in the brain that are associated with relaxation and contribute to easy and rapid sleep onset. Valerian extract reduces the excitability of the central nervous system, relieves the signs of stress, thus facilitating sleep onset. Its effect is due to the presence of an essential oil most of which is an ester of borneol and isovaleric acid. Valepotriates and alkaloids – valerine and chatinine also have a sedative effect. Clinical studies have demonstrated a significant improvement in the self-assessment of the quality of sleep while on valerian extract. The extract potentiates the effects of others ingredients. СОНОМЕДІН® is the best nature has created for healthy sleep! NUTRITIONAL AND ENERGY VALUE (CALORIC VALUE) FOR DAILY INTAKE (2 CAPSULES OR 500 mg): proteins – 0.135 g, carbohydrates – 0.0099 g, fats – 0 g; 0.5796 kcal/ 2.4246 kJ. 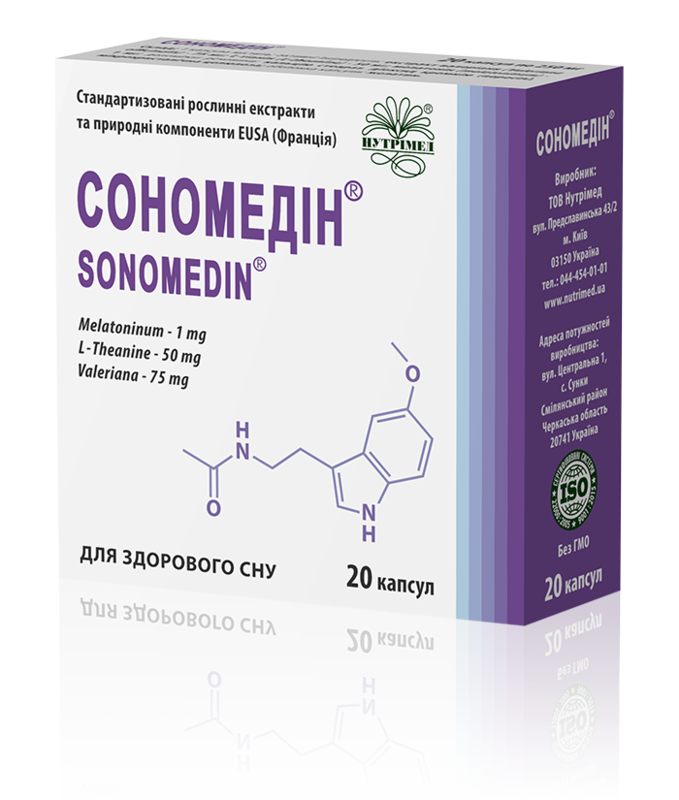 RECOMMENDATIONS FOR USE: SONOMEDIN® is recommended as an additional source of biologically active substances of herbal origin and amino acids to improve sleep onset, quality and duration of sleep. It contributes to easy sleep onset, physiologically regulates circadian rhythms, including in long travels, and relieves the negative effects of daily stress. It does not cause drug tolerance or heavy awakening. METHOD OF ADMINISTRATION AND RECOMMENDED DAILY DOSE: adults should take 1-2 capsules daily 30-60 minutes before bedtime. The treatment course is 2 to 4 weeks. CONTRAINDICATIONS: pregnancy, breastfeeding, individual hypersensitivity to the ingredients, pediatric use, autoimmune diseases, lymphogranulomatosis, leukemia, lymphoma, myeloma, epilepsy. PHARMACEUTICAL FORM: capsules with the contents weight of 250 mg ± 7.5%. STORAGE CONDITIONS: store in the original package at temperatures below 25°C, in a dry place protected from light and out of reach of children.